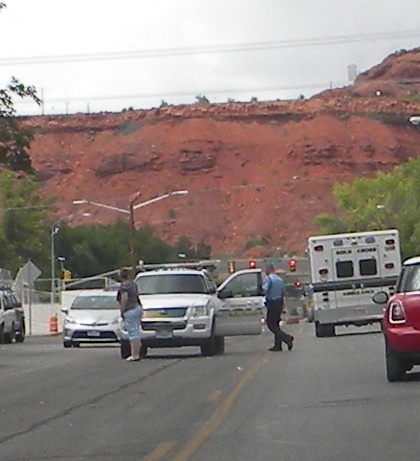 ST. GEORGE – St. George Police responded to a report of a physical fight in progress around 1:36 p.m. Monday about a block away from the St. George LDS Temple. When Police arrived they found one man had fled the scene after stabbing another man in the face just below the eye. Gold Cross Ambulance was called to the scene and transported the injured man to Dixie Regional Medical Center in St. George with non-life threatening injuries, Despain said. Before officers could arrive, the other man fled the scene and was last seen in the area of the Temple’s Visitor Center. However, officers said they have obtained his information. Was it a temple worthy stabbing? Was the stabber or the one stabbed temple worthy? We gotta know these kind of things! No ! Not near the Temple, it can’t be, it is sacred! With all these stabbings, I think it’s time to pass a “knife / sharp object” control law! This has to be stopped! A stabbin’ right next to THE LARD’S HOUSE?! Say it aint so! Two stabbings in one day? I will use my least favorite new word and say that is cray cray. OK, so you are not Happy. That has been pretty well established. So which one are you? Perhaps Grumpy? How about Dopey? Yes, Dopey. That sounds about right. . . I think many people are saying these things because of the way they may have been treated by “the temple worthy” people. Hate towards others only breeds hate right back at ya. How can this happen in Mayberry? You people do realize this has nothing to do with the Mormons and that they’re just using the Mormon temple as a geographical reference point, right? I wonder if you’d get all the asinine comments if it happened in or around the Lutheran or Catholic churches. Or maybe DSU science building for all you godless liberal folk? Science? Godless? Is that what they put in your head? Ignorance is bliss. Nor have I ever heard one use their position as an educator or scholar as an excuse to commit crimes. I have heard various Mormons use their position in the church though, John Swallow comes to mind there. Some of the worst back stabbers I’ve ever met were mormons. Major fail of magic undies. Sad. A misunderstanding? Isn’t that sort of like saying it was “an accident?” There is something wrong, somewhere, when “a misunderstanding” leads to an attempted homicide.